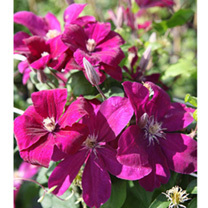 Clematis 'Rouge Cardinal' has large crimson flowers up to 15cm (6") wide that turn more purply as they age. 'Rouge Cardinal' was raised in France in 1966 and it is sometimes called 'Red Cardinal'. Flowers June-September. Height 150-200cm. Supplied in a 2-3 litre pot.